Very nice hat pattern, Carissa! I used the self-striping Sugar and Cream and it came out great. A friend wanted a cotton hat (I also live in TX), and this was just perfect. Thanks! Glad you like it. Hope your friend does too. I'd love to see pictures when you can. That'd be great. Love this hat, the colors are awake. 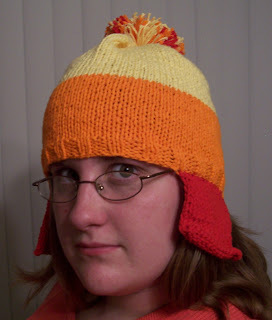 Jayne Cobb hat, that's hilarious! Thanks for that! I have a friend who has just lost her hair for the third time. I'll knit this for her to keep her head warm. It's still cold here in NM. Thank you for your generosity. Have a friend and fellow Firefly fan who is fighting cancer. She was a bit discouraged one day while we were watching the show and said she needed a hat like Jayne's so that she could be a big damn hero. I just finished this yesterday, which happened to be the day her mom had to shave her head. THANK YOU so, so much. She pulled it on and smiled a truely Jayne smile.